The Anne Frank Foundation blasts Dutch company for creating a bunker resembling the Frank family's wartime hideout, ‘tacky and offensive’. 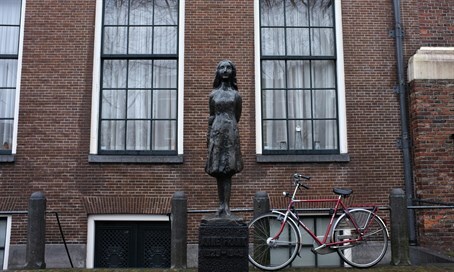 The Anne Frank Foundation has harshly criticized an “escape room” game made to look like the Amsterdam apartment where the teenage Jewish diarist hid with her family from the Netherlands’ Nazi occupiers during the second world war. The escape room trend has swept the globe with players locked inside a room with roughly an hour to decipher puzzles and find clues to break out. Now, an escape room in the town of Valkenswaard, roughly 85 miles south of Amsterdam, offers an Anne Frank experience, where you have to hide and escape from the Germans. The Dutch adventure company Escape Bunker called the attraction "an educational experience" where visitors must use teamwork, creativity and "out-of-the-box" thinking. “(The bunker) creates the impression that hiding (from the Nazis) is an exciting game, and if those hiding are smart enough they won't be caught," the foundation said, saying that the impression was historically wrong and condescending. Anne Frank became posthumously famous for the diary she kept while her family went into hiding from the Nazis in Amsterdam. She and her family were betrayed and Germans stormed their hiding place. The Jewish girl died at the age of 16 in the Bergen-Belsen concentration camp in March 1945, shortly before it was liberated by Allied forces.